Support for Palestinian terrorists is promoted at the sidelines of the UN Human Rights Council, on UN premises, and at UN-advertised events. UN-accredited NGOs may hold "informal meetings" during the Human Rights Council sessions. UN rooms are allotted by UN staff to UN-accredited NGOs upon request. Requests are approved if facilities are available and if they meet the UN's requirement that - in the words of the request form - "Accredited NGOs in consultative status with the United Nations Economic and Social Council (ECOSOC) may organize information meetings of relevance to the work of the Human Rights Council." The form also stipulates that: "Materials containing abusive or offensive language or images are not permitted on United Nations premises." These meetings are perceived as fora to influence diplomats and UN staff. 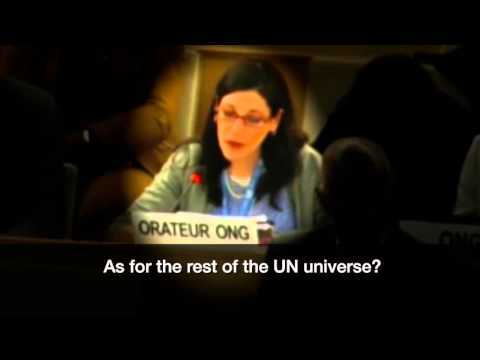 As the UN form explains: "NGO parallel events are public meetings and may be attended by NGOs, Permanent Mission Representatives, UN Staff and other persons with access to Palais des Nations." The meetings are advertised by the UN itself during Council sessions by being posted daily on the UN website under the title "Bulletin of informal meetings." On March 17, the Badil Resource Center for Palestinian Rights, held an informal meeting entitled "Israel's forcible transfer of Palestinians inside the occupied Palestinian territory". Mohammad Barakeh, Chairman of the Follow Up Committee for Arabs in Israel: "Israel is imposing upon us discriminatory racist policy... what Israel is doing is equal to a brainwashing by the Israelis." Ahmad Amara, Member of Mezan Organization: "We are unwelcomed remnants of the Palestinians who remained within Israel, and we-I mean, in their wishful thinking they would have preferred the complete ethnic cleansing... We have a settler colonial state that was established in our land... I mean, we live in an extremely hyper-violent regime." Yousef Jabareen, Member of the Arabic Block in the Knesset: "...instead of having a two state, it's having a one Jewish and Zionist state in which Palestinians will enjoy very limited self-steering, mainly in the main cities, which would look very similar to apartheids of Africa." The following material was distributed at an official side panel of the UN "Human RIghts" Council session on March 17, 2016: a CD titled "Hebron's Old City: Ethnic Cleansing via Systematic Oppression"
A female soldier in her twenties was stabbed on Thursday morning just as she walked off a bus that had stopped by the Ariel junction in the Samaria region of the West Bank. Two young Palestinian assailants had run toward her from the direction of the nearby gas station with knives in their hands, according to a spokeswoman for the Samaria Regional Council. Soldiers guarding the bus stop by the city shot and killed the two Palestinian assailants. A photograph in which one of the male assailants is lying on the sidewalk with a knife in his hand is already being circulated on Facebook. MDA paramedics treated the wounded soldier at the scene and evacuated her to the Rabin Medical Center- Beilinson Campus in Petah Tikva in moderate to serious condition. The city of Ariel, with a population of 18,400, is the third largest settlement in the West Bank. Ariel's Mayor Ariel Shaviro called on the government "to put an end to the absurd situation in which Israeli citizens are no longer safe." Two female suicide bombers killed at least 22 worshippers in an attack during dawn prayers Wednesday on a mosque on the outskirts of the northeast Nigerian city of Maiduguri, rescue officials said from the birthplace of Boko Haram. One bomber blew up inside the mosque and the second waited outside to detonate as survivors tried to escape, said coordinator Abba Aji of the civilian self-defense Vigilante Group. At least 17 people were wounded and evacuated to the hospital, said Abdul Mohammed of the State Emergency Management Agency. Umar Usman said he escaped because he was late. "We were just a few meters away from the mosque when a loud bang erupted and all we could see was dark smoke and bodies littered around," he told The Associated Press. The mosque is in the Boko Haram stronghold of Umarari on the outskirts of the city that is the command center of the Nigerian military's war against Boko Haram Islamic insurgents. Several suicide bombers have exploded in recent months at roadblocks leading into the city manned by the military and vigilantes, indicating success in preventing attackers from reaching crowded areas. It is the first attack on Maiduguri since Dec. 28, when Boko Haram attacked with rocket-propelled grenades and multiple suicide bombers, killing at least 50 people.